Charly Records' The Chess Years has assembled most -- though not quite all -- of the music that the Originator recorded for Chess Records, which, unfortunately, means a lot of his lesser work as well -- 282 recordings, made between 1955 and 1974, on 12 CDs; looking at it is like staring across the Grand Canyon, except you want to jump into this if you have any sense. If the collection seems like overkill, that's because it is, and there's some poor material here from the late '60s and early '70s, when Bo was searching for a new commercial sound, although some of the latter isn't really bad -- his covers of Al Kooper's "I Love You More Than You'll Ever Know" or the Band's "The Shape I'm In" from Another Dimension are soulful and moving, but just aren't what one buys a Bo Diddley album to hear (along with the girlie chorus on "Bad Moon Rising"). There are more than enough jewels -- and jewels that are likely never to appear otherwise on compact disc -- to attract serious rock & roll listeners, if you can swing the price, which is around $120. The highlights (which would be far more costly to find on vinyl today) include "Bo Meets the Monster," his catchy (and very funny) answer to "Purple People Eater"; "Here 'Tis," which became famous when covered by the Yardbirds, but only really comes to life in the hands of the originator; the comical "Bucket," "Lazy Woman," and "Run Diddley Daddy"; the rousing, slashing "Puttentang"; the side-splittingly funny biographical song "All Together," a sort of sequel to "The Story of Bo Diddley"; the complete Bo Diddley's Beach Party album, and a handful of demos from the late 1960 sessions that yielded tracks for the Bo Diddley Is a Twister album. 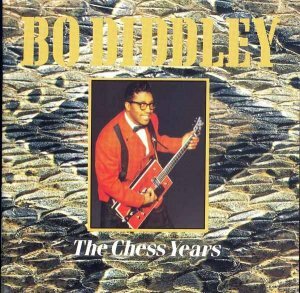 Additionally, the collection gives the listener a chance to see how Bo explored different variations on his sound, adapting it to doo wop, folk, and even calypso, all of which worked better than one would have expected, plus soul and funk, which didn't. The sessionography is very detailed and pretty cool, and the notes are among the better biographical accounts of Bo's life and career -- oh, and there are lots of pictures of Bo and the Duchess re-created throughout the set. There are problems with the mastering, however -- momentary gaps exist in one or two songs, and the sound quality in certain places, such as the live Beach Party material, leaves something to be desired. But at its best, and that is often (at least through the mid-'60s), this set presents one of the primal forces in rock & roll.